Proprietary Name: Oatmeal Skin Relief Calming . 8oz What is the Proprietary Name? Non-Proprietary Name: Dimethicone What is the Non-Proprietary Name? 57337 - Rejoice International Inc.
57337-100 - Oatmeal Skin Relief Calming . Oatmeal Skin Relief Calming . 8oz with NDC 57337-100 is a a human over the counter drug product labeled by Rejoice International Inc.. 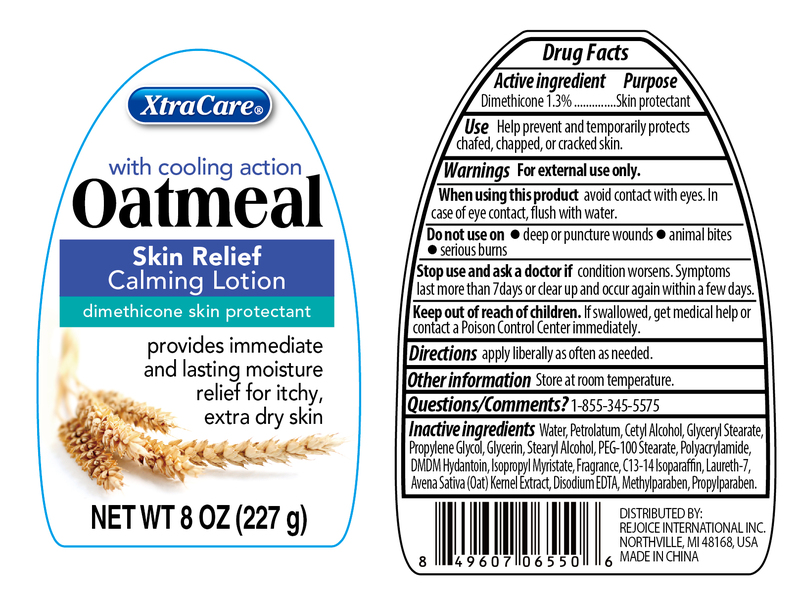 The generic name of Oatmeal Skin Relief Calming . 8oz is dimethicone. The product's dosage form is lotion and is administered via topical form. Labeler Name: Rejoice International Inc.
FDA Application Number: part347 What is the FDA Application Number? Marketing Category: OTC MONOGRAPH FINAL - A product marketed pursuant to a final Over-the-Counter (OTC) Drug Monograph. What is the Marketing Category? Start Marketing Date: 03-07-2019 What is the Start Marketing Date? ﻿Keep out of reach of children.﻿ If swallowed, get medical help or contact a Poison Control Center immediately. ﻿Use﻿Help prevent and temporarily protects chafed, chapped, or cracked skin. Stop use and ask a doctor if conditions worsens. Symptoms last more than 7 days or clear up and occur again within a few days. ﻿Directions﻿ apply liberally as often as needed. ﻿Other Information﻿ store at room temperature.